Republican Tom DeLay, a powerful and feared conservative who is beset by controversy, said Tuesday evening that he is resigning from the House of Representatives. Two criminal investigations have dimmed his prospects for re-election. Although the announcement shocked many, it wasn't a surprise that DeLay's political future was in limbo, because his reputation in Washington had been seriously tarnished — among both Democrats and Republicans, CBS News correspondent Gloria Borger reports. Republicans have come to understand that DeLay is a liability. He's under indictment in Texas for money laundering — and two of his former staffers have pleaded guilty in the Jack Abramoff congressional bribery scandal. But DeLay repeatedly has said he has "no fear" of any investigation. DeLay said he is resigning because voters of his congressional district "deserve a campaign about the vital national issues that they care most about and that affect their lives every day, and not a campaign focused solely as a referendum on me." For one of the few times during DeLay's 21 years in Congress, Republicans have reason to worry that they could lose his seat in November's election. DeLay said his love of and loyalty to the party played a role in his decision. He said by staying in it could let Democrats "steal this seat with a negative campaign." A former Democratic congressman is running for DeLay's seat. Legal experts say the Justice department is circling him. Borger reports that the growing tide of GOP discussions of DeLay's political future might mostly be a money game. Republican House leaders had been discussing Delay's future with him for months. "We would have spent five or more millions of dollars defending this seat," said Vin Weber, a Republican lobbyist who served with DeLay. DeLay's surprise decision came less than a month after he won his party's primary election. He has been known for his fundraising prowess and a bare-knuckled political style that earned him the nickname "The Hammer," reports CBS News correspondent Bob Fuss. He was a key force in advancing the conservative agenda of President George W. Bush, a fellow Texan. Mr. Bush, who has been generally supportive of DeLay during his career implosion that led to Tuesday's action, wished DeLay well and said the congressman had made a difficult decision. Mr. Bush predicted, however, that DeLay's problems will not harm the party. "My own judgment is that our party will continue to succeed, because we are the party of ideas," Bush told reporters at the White House. It was unclear whether the DeLay situation would further weaken Bush. Public approval of the president, who is constitutionally forbidden to run for a third term, already is near the nadir of his five years in office. Polls have shown his popularity fading principally because of the slogging pace of the Iraq war and reconstruction; the mishandling of relief for victims of catastrophic hurricanes last year; a furor over the unannounced decision to turn over significant management of major U.S. seaports; and other perceived episodes of political and managerial mistakes. DeLay called Mr. Bush on Monday, and the two talked while the president flew on Air Force One back to Washington from an appearance in Ohio, White House press secretary Scott McClellan said Tuesday. "The president thanked him for his service and all that he accomplished and wished him all the best," McClellan said. "Congressman DeLay has been a good ally." The latest jolt in DeLay's career culminated a slide from the peak of power that began 1 1/2 years ago when the House of Representatives Ethics Committee admonished him for three incidents of misuse of his office as majority leader. Slowly at first, the succeeding months drew the scent of scandal ever closer to DeLay. Finally, in January, he gave up his determination to reclaim his job as majority leader, the second-ranking House official, and members rejected DeLay's hand-picked successor. As Borger reports, the former House majority leader's resignation could make the Hill a very different place. One House Republican told Borger that some are hopeful for more diversity of opinion, and maybe even an effort to deal with the Democrats. DeLay quit after his party colleagues rebelled and rescinded legislation meant to protect him despite his legal troubles. Last week, former DeLay aide Tony Rudy pleaded guilty to conspiring with Abramoff, DeLay's former close friend who also has pleaded guilty to federal charges, and others to corrupt public officials. Rudy's plea was affixed to a promise to help federal investigators build a case in a broad investigation of bribery and lobbying fraud that already has resulted in three convictions. Neither Rudy, Abramoff nor anyone else connected with the investigation has publicly accused DeLay of breaking the law, but Rudy confessed that he had acted illegally while working in the majority leader's office. DeLay has consistently denied any wrongdoing. DeLay, who turns 59 on Saturday, said he would resign before mid-June, contingent on the congressional calendar. In a video statement made available to television news networks late Monday, DeLay blamed "liberal Democrats" for making his re-election campaign largely a negative one, reports CBS News correspondent Sharyl Attkisson. Democrats said DeLay's plans to step down marked more than the end to one man's career in Congress. 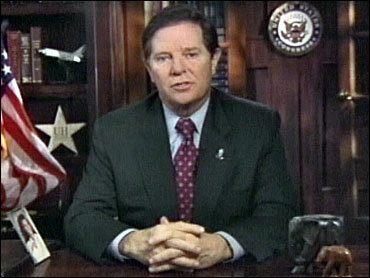 "Tom DeLay's decision to leave Congress is just the latest piece of evidence that the Republican Party is a party in disarray, a party out of ideas and out of energy," said Bill Burton, a spokesman for the Democratic Congressional Campaign Committee. As Borger reports, "Delay is also the poster child for what the Democrats call the 'culture of corruption' in the House, and he realized that he would be a huge liability, particularly given his own legal problems in the Abramoff affair and also the fact that he is currently under indictment in the state of Texas." DeLay has already won the Republican primary. Rather than hold a special election for his replacement, the state central committee will probably appoint a replacement candidate, says CBSNews.com political analyst Dotty Lynch. The committee has until August to get another Republican candidate on the November ballot. It was unclear whether Texas Gov. Rick Perry would call a special election to fill out the unexpired portion of DeLay's term or let the seat remain vacant until it is filled in November. Either way, DeLay's concern about the potential loss of his Houston-area seat long in Republican hands reflected a deeper worry among party strategists. After a dozen years in the majority, they face a strong challenge from Democrats this fall, at a time when Bush's public support is sagging and the Abramoff scandal has helped send Republican-controlled Congress' approval ratings tumbling. Democrats now stand a very good chance of winning DeLay's seat, Borger said, and if they do, then they've only got 14 more seats to go. "Really, the control of the House of Representatives is what's at stake here," Borger added.